Professional WordPress themes are hard to find these days as most of the templates available online follow basic designs and give generic appearance. So, to solve this problem we came up with a list of 6 top class professional looking WordPress themes which are well designed, responsive, offer a great number of features and easy to work on. In this blog, we have explained themes which are tested & certified by professionals and above all, they hold thousands of active installations on the web. You will find paid as well as free versions of the themes here. 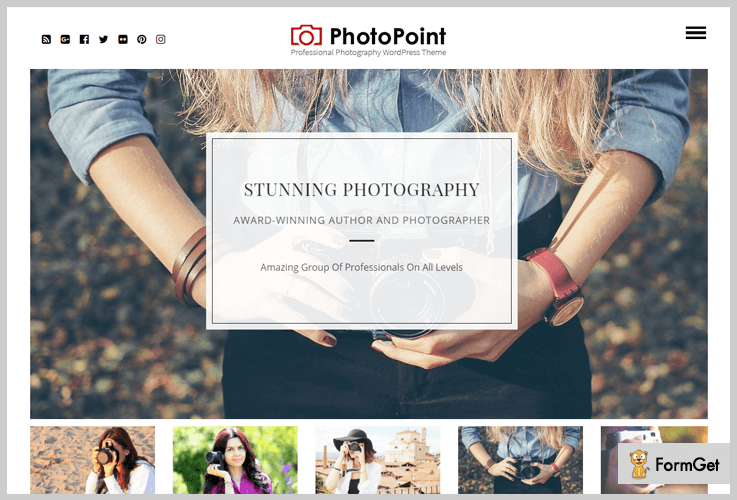 PhotoPoint is a professional WordPress theme which holds various advanced features suitable for photographers, visual artists, graphic designers, art gallery owners, etc. With this theme, you get multiple color options and menu styles along with custom CSS adding option. It requires just a few clicks to add high-resolution images and media content on the website with landscape layout. Professional photography WordPress theme comes with lifelong subscription and developers license for which $79 is charges. You also get WooCommerce and WPML compatibility with it. Built-in contact form to fetch fans and customer contact details. 10 unique color options to add appearance to the website. Menu button at the top along with social media and logo integration option. Responsive boxed layout which looks great on various devices. Display high-quality images in 4 different blog display styles. 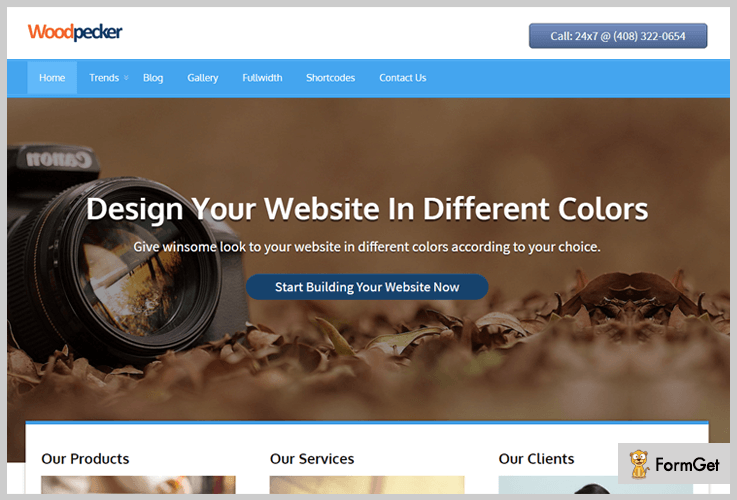 This is a premium WordPress theme which is built using HTML5 and CSS3 codes. It offers a unique looking website to people who are professional speakers, protesters, NGO, and others involved in peaceful protest activities. 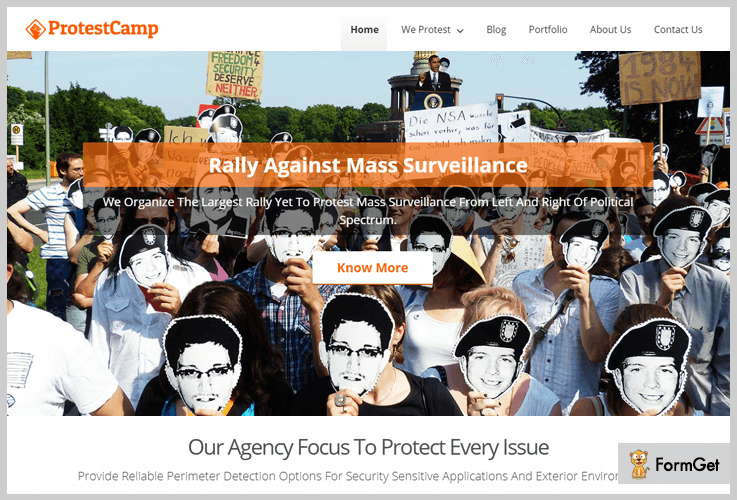 Protesters agency WordPress Template has got features like the full-width slider, social media integration, strong admin panel, custom footer and multiple color choices to give a custom appearance to the website. $79 is the cost of professional protesters agency WordPress theme with which you get lifetime updates and technical support. Attach slider images along with text description and call-to-action button. Display your professional services in the 4 column featured area with hover effects. WooCommerce, WPML, and plugin compatible and coded keeping SEO in mind. This theme also supports the right-to-left feature. Accordion service section to project top class services in an attractive way. Using Woodpecker WordPress theme you can simply design a responsive website without any coding skills. This theme comes pre-equipped with a vast range of features that are videobox, custom menu, feature description space, social media icons, call to action button and more. Woodpecker is one of the best professionally crafted theme which provides developers license, powerful admin panel along with free demo content. Woodpecker is a professionally designed WordPress theme which charges $59 for all features, demo content, instant support, frequent updates and more. The premium membership of InkThemes charges $147 for the first month, later $15 every month is charged. With this plan, you get 49 themes and a new product every month. Themes+Plugins membership plan by InkThemes charges $247 the first month, then an amount of $15 each month. You get access to 49 themes, 10 plugins plus one product each month as a bonus. VideoBox to showcase high-resolution images and HD video clips. Multipurpose theme which comes with developer license. Allows attaching custom CSS and styling. Cross browser compatible and supports latest WordPress versions. Widgetized footer and sidebar areas. Butterbelly is an easy to install multipurpose WordPress theme which is WooCommerce enabled and support various other plugins. With this theme, you can create product page, add payment gateways, manage shopping cart and more from WordPress dashboard. It allows you to add logos, favicon, display customer reviews, services and blogs in an attractive manner. 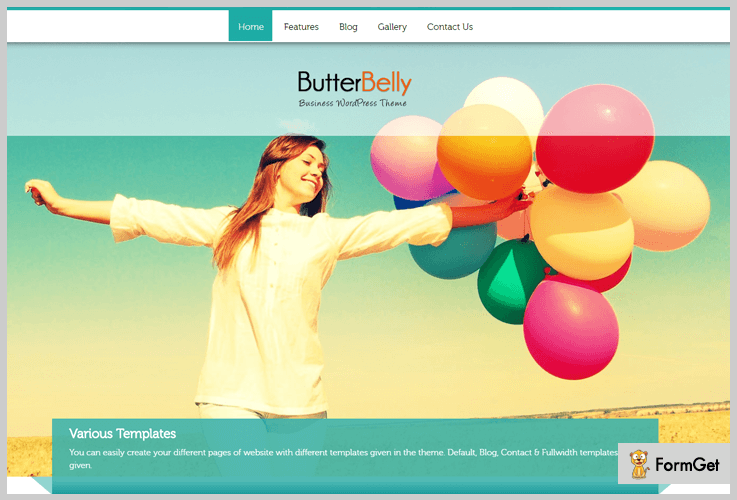 With Butterbelly corporate business theme, you will get a fully responsive template which is filled with features. It is WooCommerce compatible and comes with a price tag of $59. It comes with built-in contact form by FormGet to collect customer details. Dedicated blog post area on the homepage to display recent blogs. Allows product creation and ‘add to cart’ facility. Accept payments from products and service via PayPal integration. Responsive, retina ready and fully optimized with SEO. If you want a single page website which provides smooth navigation then One Page WordPress theme will be best for you. This template is simple to customize, user-friendly, fully responsive, multiple edit options, admin panel and the most exciting thing is that it’s totally free of charge. 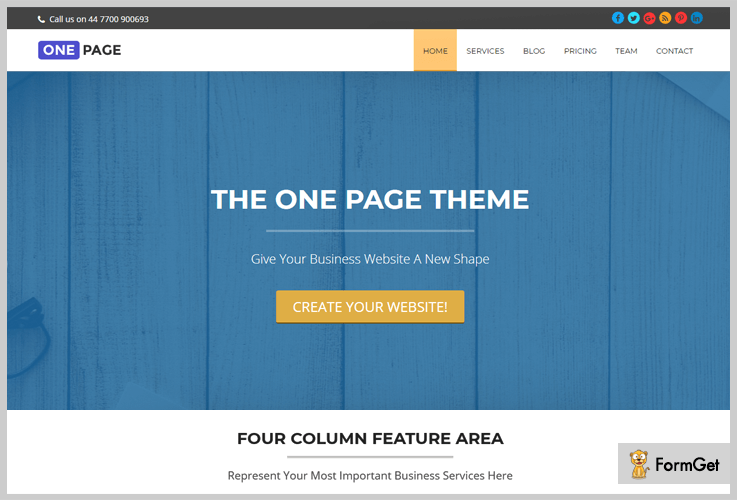 One Page is a professional WordPress theme which offers single page layout and responsive design at no cost. Yes, this is a free theme which can easily be downloaded from wordpress.org. 4-column features area to show different services and their details. Add custom menu and widgets like the search bar, categories, etc in sidebar. Attach background and featured images with a few clicks. Creating a responsive and good-looking website to project professional services that your business offers can be an expensive task. But this is not the case with BlackWell corporate WordPress theme as it is totally free. With this theme, you can easily build corporate websites as it holds options panel for customizations, full-width slider section, testimonial/sidebar space, stylish vertical menu and more. 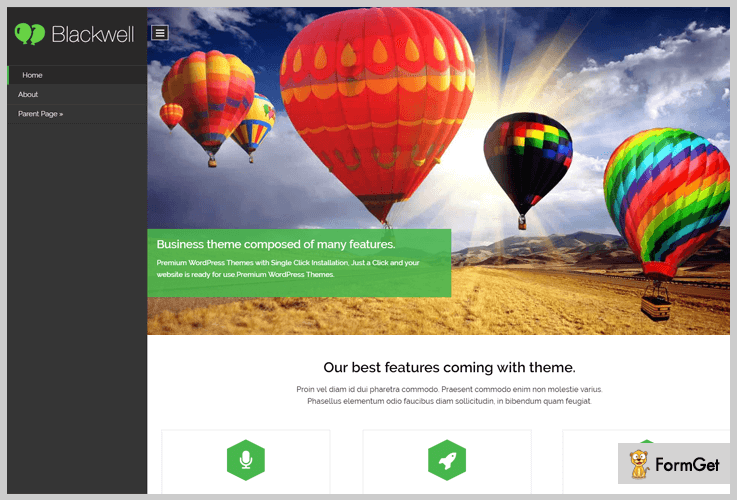 BlackWell is an entirely free WordPress theme which provides an advanced theme options panel to apply multiple customizations like logo change, text styles, color options and more. Vertical menu style with a button click in and out facility. Full-width featured image area with text description space. Accept and displays threaded comments. Provides 5 different widgetized areas on the site. It’s time to close as we have reached the end of this blog. We hope that you must have found a professional WordPress theme to create an elegant website for your business. This was all from our side for any questions and queries do contact us through comments below.